I made these cupcakes for a dinner party I will be going to tonight. I wanted to make something to compliment the Asian-inspired menu. It was also a good time to try out some vintage molds I bought at a flea market last weekend. I figured something dense and moist, like this recipe, would be easiest to unmold. 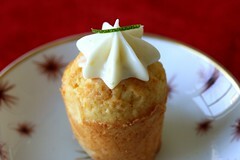 The texture of this cupcake is interesting, not quite a cupcake or a muffin… almost like a fruit cake, but nicer. The cake is moist, chunky, and fruity. After having tasted it, I felt that vanilla pastry cream would have been a nice compliment. Unfortunately, with limited time to shop for more eggs, I stuck with the plan of ginger-lime cream cheese frosting. The end product is still delicious and I will happy to bring them to the party. On a side note, yesterday was the official one year anniversary of the blog. This will be the 30th cupcake recipe that I have posted and to celebrate, oh how exciting, I will be posting the 31st tomorrow. And lastly, for those of you in the bay area, I am told there may be an article about cupcakes in this Wednesday’s San Francisco Chronicle, in the food & wine section. Check it out if you get a chance. NOTE: If you are not sure how much ginger taste you might like, start by adding half the amount and taste/adjust until you get the ginger flavor you like. 2. top with lime zest. Ooooh, pretty. Can’t wait to check out Wednesday’s Chronicle. Thanks for the tip! Looks very beautiful and sounds delicious (as always)! Happy anniversary! oh yum! tropical and pretty! Love the ingredients. Look & sound delcious. Oh, how beautiful and delicate. Gorgeous. I think I will try this, but with mango, since we have no papaya in the house. I suppose you could experiment with almost any fruits, though? You definitely could. Banana, papaya, pineapple, any of those would work. 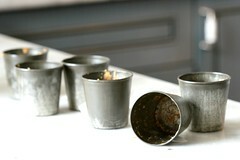 Question for you… I really like the little molds you used for these cupcakes… they look like vintage tin? Wondering where you found them? I like the individual tins! They are indeed vintage. I got them at a flea market in San Francisco this past weekend. Chockylit, you mentioned that a filling of vanilla pastry cream would be a nice compliment to this recipe….is there a particular recipe you’d recommend? I’d love to try it. …although I live in Minneapolis, I was able to check out the story in the San Francisco Chronicle today…congratulations! What a great article! Thank you for sharing your ideas and inspiration. I read the Chronicle article and linked to you in my local San Fran happenings blog. I’m so glad I found this blog! Everything looks delicious! This recipe says “1/4 coconut milk”: Do you mean 1/4 can? 1/4 of the milk from a coconut that one cuts open oneself? I’d love to make this recipe this week! oops, sorry. i added the cup. I should have been specific.. I used sweetened, shredded coconut I bought at the store. I find the packaged unsweetened stuff to be too savory tasting. Getting back to sawsee. I don’t have a recipe off hand. I usually go to one of my cookbooks for a basic recipe. MarthaStewart.com is a reliable resource for this kind of thing as well. Just wanted to say, I did get around to making these on Wednesday, and we all loved them. The Consort & I loved them because they aren’t at all like kid cupcakes, they’ve got heft, texture, and great “grown-up” flavor. On the other hand, the girls really liked the cupcakes too, so maybe it isn’t “grown-up” as much as “universal”. Thank you for this great recipe. I will definitely be trying some others! Imperatrix, I thank you for your nitpickiness.I read the recipes over and over before I post them, but at that point my brain is in a sugar-induced stupor. I seriously need to signup a friend or something to edit, as opposing to relying on your gracious selves. Hi Chockylit!! I tried out this receipe and honestly it was the BEST cake i ever made!! Thank you!! Btw would you have receipes for Basic Vanilla cupcakes? Something thats fluffy and nice. I have been looking around the internet and haven’t found much. Wow , never thought cupcakes are this interesting !!!! Chockylit, those photos are beautiful…you must be blessed with naturally good lighting! I was surfing for a recipe to bake in Chinese mooncake molds for my wedding next summer. This recipe seems perfect! I was thinking of using that frosting for the inner filling. How did these cakes turn out for you? Do you think they would do well in mooncake molds? Do you think the carved designs of the molds would be visible after baking? Do you think that this cake would withstand a frosting center? Sorry for asking about a million questions, but on paper, that recipe looks AMAZING, but not too drastically difficult. 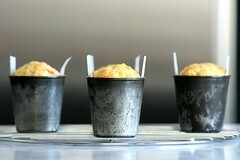 It will most likely be extremely hot and humid on my wedding day, so a recipe like this would be sweet and refreshing! Your blog looks great, I will be reading often! Hi, sara dawn. I do have great natural light in my kitchen. It really helps. I think this recipe should work fine with the molds. You should definitely test it first to make sure you can see the designs of the mold. I think its a good idea to use the frosting as a filling. In part, because you are talking about a summer wedding and this frosting wouldn’t hold up well in a hot environment. The cakes turned out fine for me. I used them in a mold and they released fine. They are definitely substantial enough to withstand a filling. Thanks so much for the advice…I can’t wait to make these! These took me about four hours to make, but it was really fun and the results are yummy. I’ve gotten a lot of compliments. The presentation tip was especially useful, although I substitued apricots for papaya and that worked well. Thanks so much! Thanks for this recipe! I made them last night and despite some rather horrid substitutions I had to make, they turned out fabulous! 1) Discovered too late that I had no white flour. So I made them with (gulp) whole wheat. The texture is closer to a muffin than a cupcake, but they are still surprisingly yummy. 2) Read your suggestion about different fruit, and since I had pineapple, I just used it. Very tasty. 3) For the frosting, I tasted it and wanted it more “lime-y” so I added about 1/2 t lime zest and I thought it made it a bit more tangy and tropical. Tasty. I made these cupcakes a couple of nights ago as a trial-run for a party next week. Yummy! I will definately either be making these, or one of your other awesome tropical cupcakes. While I was baking, Serious DJs (my boyfriend + our good friend) were working on a mix for their website – seriousdjs.net. They enjoyed the snacks so much, they named the mix after them. A strange tribute to your recipie, but I thought I would let you know. I made these a couple weeks ago and substituted the papaya for pineapple and the result was really good. You can easily taste the coconut, but you couldn’t tell if there was papaya or not. There was a pineapple texture, but, not much taste of the pineapple itself. I used a vanilla frosting instead of the one mentioned above, and people liked it. My sister tried it and she said that without the frosting, it’d be a bit bland. But it was good though. :D I think I’m gonna make these again once I stock up on ingredients. Just wondering how you get your cute little loops of zest to decorate? I always seem to get thicker slices, or they come out straight and I cannot ‘curve’ them around like you have. I use a proper zester. Maybe I am pushing too hard? Tips would be very useful! 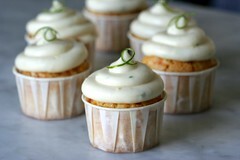 My first visit (via Stumbleupon) and was thrilled with these beautiful cupcakes. Coconut is very popular around our house. Thanks for this recipe, I made it for a birthday party last night and it was a big hit! Goes great with fruity drinks too. I absolutely love your blog! This recipe has inspire one of my paintings, I named it “Ginger-Lime Frosting Cupcake” and added the link to your blog in the posting. I will be posting more paintings after baking some of your recipies. I bake…I taste and then I paint them from memory. These were great. The papaya sort of gets lost in the flavor of the cupcake itself, but the coconut shines through so it still tastes great. The texture of the papaya chunks adds a bit of fun. I substituted lemon in the frosting and it worked well. I also added about a tsp of zest to make the frosting more tangy. This really made the cake a little less mild. hai ur site is truly inspirational,can i add mashed papaya instead of chunks?? Do you use fresh papaya or dried?